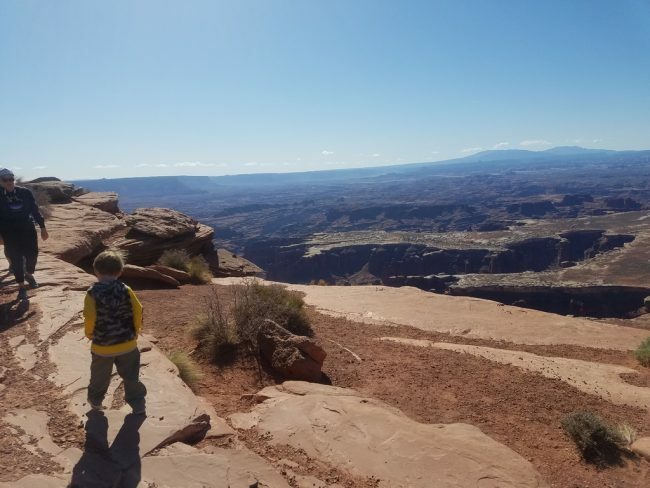 Canyonlands National Park was the 5th and final stop on our Utah hiking trip with kids. 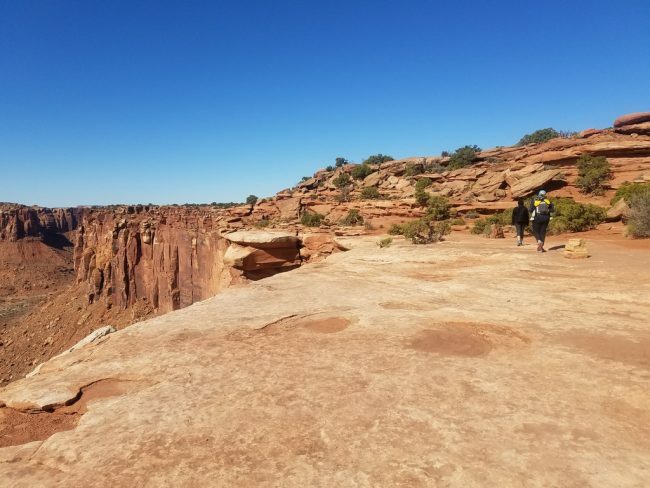 Canyonlands National Park is an immense and sprawling region with several unique areas to explore. 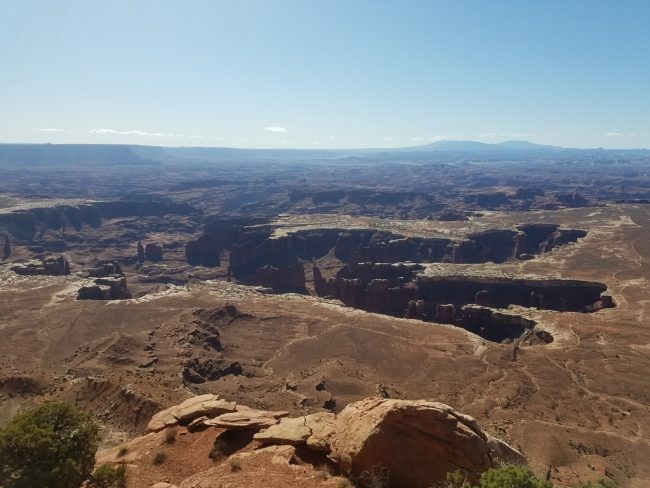 Broken into four districts which require hours of driving to traverse, Canyonlands is more like a series of parks than a single location. 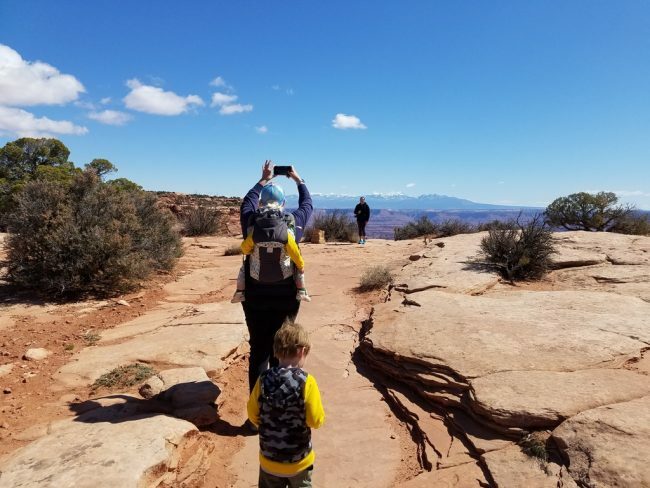 We decided to limit our visit to the Island in the Sky district which is notable for two major attractions: Grand View Point and the famous and accessible Mesa Arch. 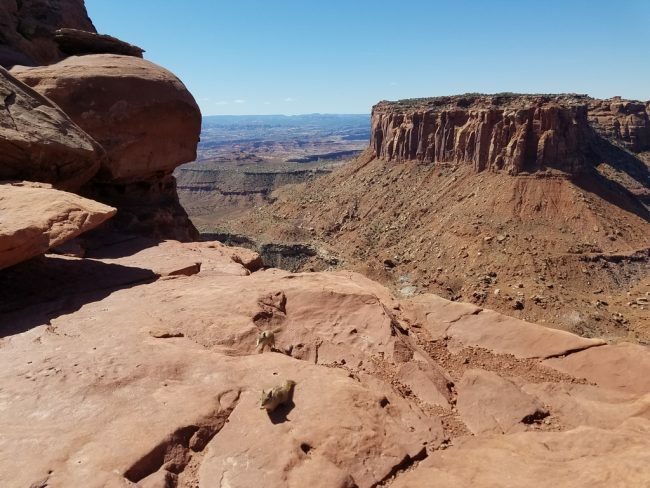 The drive to the Grand View Trail was less than an hour from Moab and the entrance to the trail had an odd feeling. 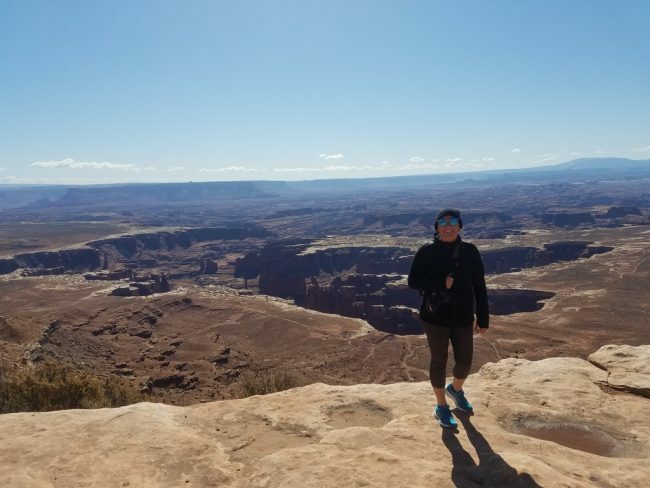 Unlike Bryce Canyon, where your skirt the rim of a deep canyon before descending from a level ground, driving through Canyonlands made me question where I was in relation to everything else. Was I high along the top of a cliff or was the earth descending all around me? The hike (more like a walk, just 1 mile and flat) to Grand View Point was one of the most unique trails I’ve ever been on. Right by the parking area is a commanding view over the edge of a sheer cliff. Far below us along the wide canyon floor was an even deeper canyon that descended much further down with an equally sheer cliff. These stratified levels increased my feeling of uncertainty about where the ground level actually was. Are we high on a cliff or does the canyon descend doubly low? We started down the trail, simply following the edge of the cliff. 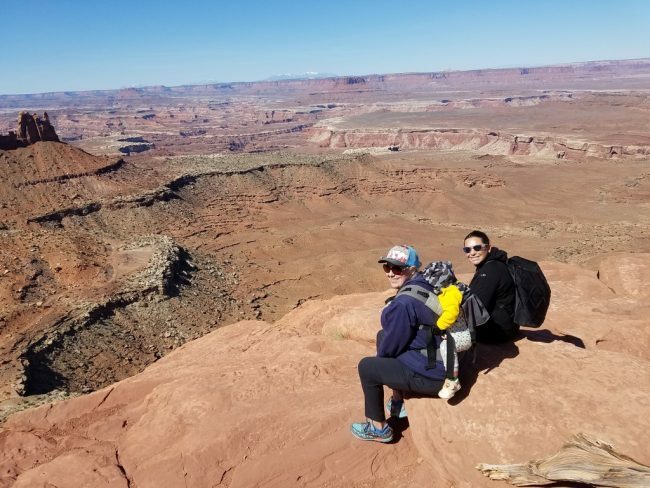 For most of the hike you walk right alongside this amazing view and after a time it begins to feel normal to be just a few feet away from an unprotected thousand foot drop. 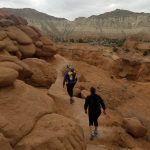 Although the photos make the trail seem vertigo-inducing at points, it always felt like we were on safe and stable ground. There was no wind, no crumbly ground and no sloping edges. 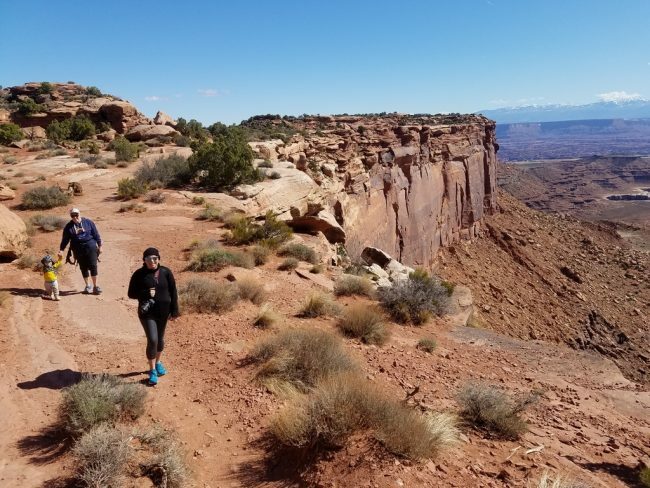 The trail felt more like walking 10 feet away from an open manhole cover: if you keep a reasonably safe distance you won’t feel any risk near it. OMG, the edge is so close! 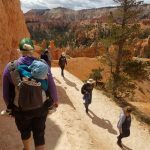 We felt comfortable letting our 3-year-old walk the entire length of trail as long as he was always within grasp. It wasn’t much different than walking with him along a city sidewalk. At the end of the hike we got an entirely new view, the Grand View Point. Where the canyon had been on our left the entire hike, now it opened up for a panoramic view in front of us. The end of the hike made a nice location for a small break and a snack before returning. After our time in Arches National Park we thought we’d seen it all, but Mesa Arch was worth one last stop. 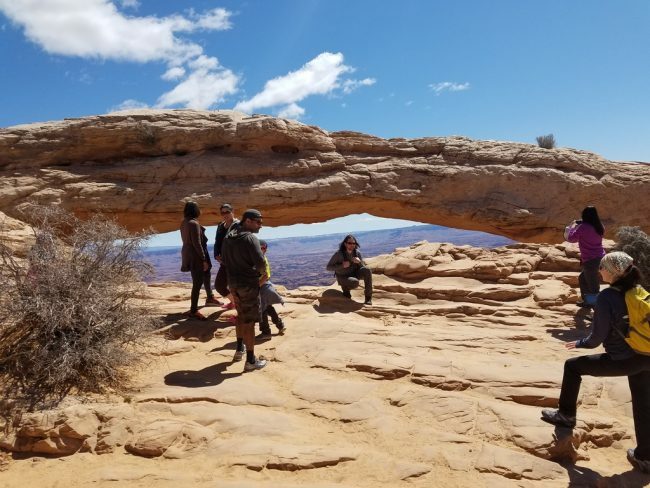 It was just a short walk (1/2 mile) to the arch from the parking lot and the prize was a low-hanging arch with a canyon view through the arch. 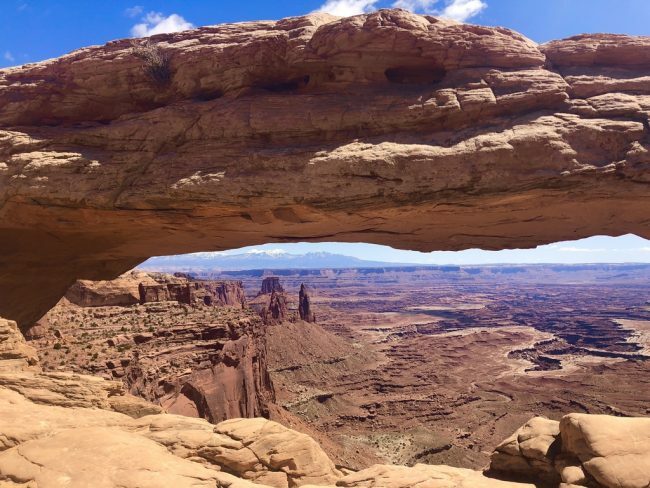 Mesa Arch seemed to somehow combine all of Utah’s most famous natural features in a single attraction. Arriving mid-day meant there was a pool of tourists waiting for their photo op in front of the arch. We decided to take a few shots from the side but skipped waiting in line for that perfect shot. Mesa Arch made a fitting end to our Utah hiking trip. 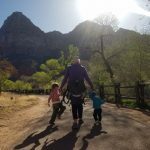 It felt a little crazy to attempt a hiking trip with a 3-year-old and 1-year-old, but Utah’s parks are so full of natural attractions that we rarely felt like we were missing anything. In fact, many of the most famous sites were wheelchair-accessible or barely required leaving the car. Still, there were so many locations we just drove by or didn’t have time to visit that we are certain to return to Utah for more hiking with our kids. All that was left was the drive back to Las Vegas to catch our flights home. We had a low gas scare (100 miles to the next gas station? Uh oh!) 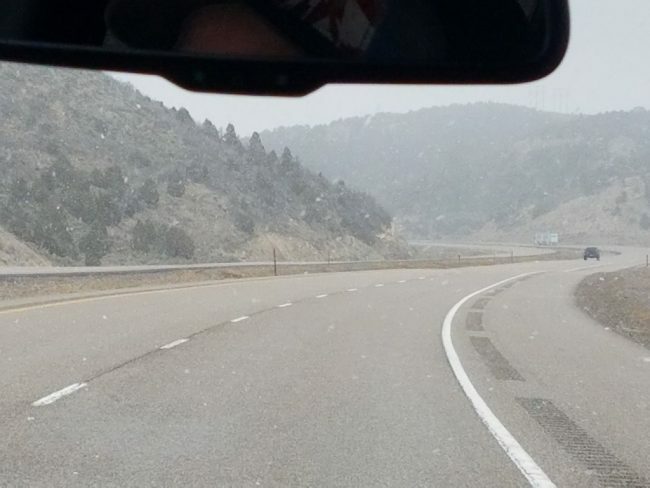 and… snow? 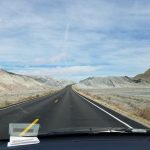 Crossing the mountain to Vegas turned out to be an adventure in itself. Luckily, we didn’t run out of gas and the temperature was a balmy 75 degrees by the time we arrived in Vegas. Another successful trip! 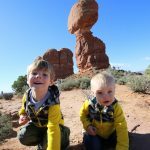 Thanks for reading about our two week Utah hiking trip with kids!